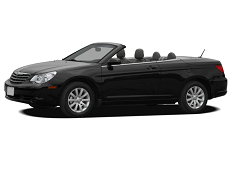 Correct Wheel Sizes, PCD, Offset, Rims and Tire specs for Chrysler Sebring series. I got a 05 4 door Chrysler sebring and I was wondering can I put any other 16 tires on it like a 215 60 or 65 r16?? 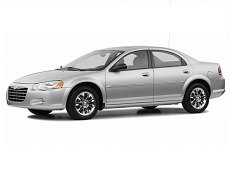 I have a 1997 Chrysler Sebring LXi 2 door coupe 2.5L engine. I know my tire size is 215/50R17. I need to know what my rim size is. Thanks for your reply. One additional question. Can this same car take a 17 X 6.5 rim? 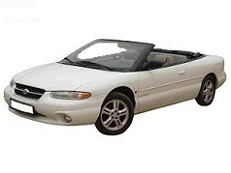 I got a 1999 sebring convertible 2 door jxi with a 5x100 bolt pattern. I want to put 20 or 19 inch rims on it ? Im having a hard time ? what do I need to do to make it possible? need more info to make it work? or what can I do or adjust to be able to put on 20inch rims? Hi,Dave,I think you should mention:1,make sure the bolt pattern is 5*100.2.make sure the offset should be within 40-45mm.3.make sure the tire size is fitble.Can you show me your new and old tire size?i can help you confirm it. Would a 35mm offset be possible? Hi,cody,no,it can not fit for .Try215/55/17. I got a set of 225 / 45 / 17 I pulled of a Sebring coupe not sure what year , those should work yea? They are a lot smaller than the 55s. Hi, shannon,The OEM wheels for your car is 16'',but if you truelly want 15'',It can also fit. 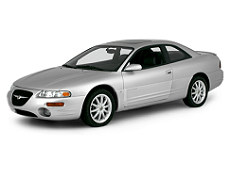 Will the tires and rims on a 2003 Sebring lxi fit on a 2000 Sebring lxi ? 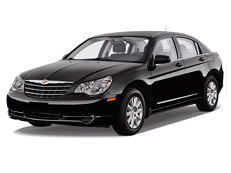 Do 20 inch rims fit on a 2004 Chrysler Sebring? Hi,Vanessa,Yes,but it is little big.I think 19'' is better.And make sure the bolt pattern are same and offset are similar. Hi,Bailey,You need to confirm whether the wheel size is same for your two sebrings.If they are in same size,The tire can change from the old to the new. Will 20 inch rims from an 06 Honda Civic fit on my 2000 Chrysler Sebring? The bolt pattern seems to be the same. Can 235 55 17 for my 1998 Chrysler sending Liz coupe? My Sebring has 20" tires (255/50/20) on Chrysler rims - will 245/50/20 tires fit on theses rims? Hi, Kevin! Thank for your message. I think you mean JR/ST generation and, of course, it has 5x100 PCD. But the model year of this generation is 01-06 (not the beginning of the production or start of sales). JR/ST model year 2001-2006 - 5x100. I dont understand what you are trying to say here. I have a 2000 JXI, and it doesnt have 5x114.3 as stated. The listing says ALL TRIMS also. I referenced your website in the past and it was helpfull. But this time I did the same, bought wheels based on your list and its entirley wrong. You cost me a bunch of money. You should correct the mistake! We are regret that misled you, but the data on this site are for informational purposes only and the best way to buy wheels is still remains a real fitting. We have updated the data, and now I understand where was a mistake. Speaking about FJ/JX generation I mean vehicle platform, not trim level. FJ (LX\LXi, Coupe) like his twin Mitsubishi Eclipse has 5x114.3/67.1. 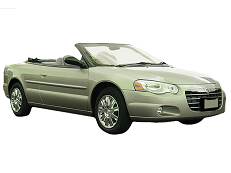 Another case is JX platform (JX\JXi, Convertible) has 5x100/57.1 like many other Chrysler cars. When entering the data, we are guiding by power and engine capacity, as the info about trim level is not always easy to find. We will be very happy if you inform the actual size and tire pressure as specified on your original door sticker. I see your point, platform vs. trim. Also happy to see the correction so quick. I appreciate that. Thank you for your attention, we hope that will be useful in the future! 215/60/70 tires, can I use 225/60/17 ? Hi,Jackie bakic,5*112 can't fit for 5*115.